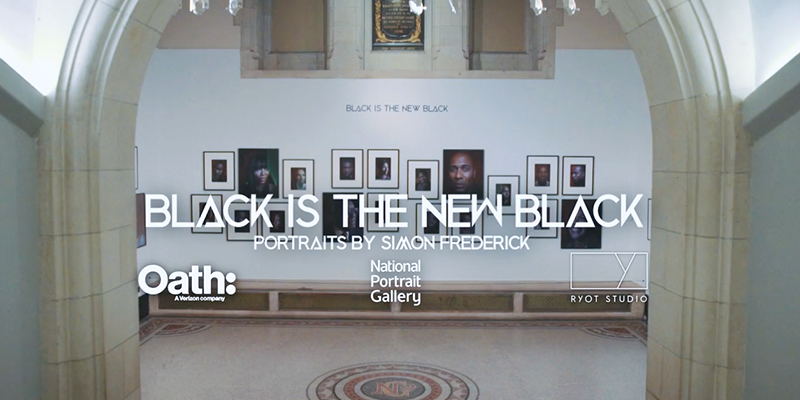 Oath proudly supported the recent launch of the 'Black is the New Black: Portraits by Simon Frederick' exhibition at the National Portrait Gallery. The landmark 2016 BBC television series, Black is the New Black, celebrated the breadth and diversity of black achievement in Britain. Artist and director Simon Frederick invited influential Britons from a variety of professions to share their insights into being black and British today. Their interviews raised complex questions around British identity and painted a unique portrait of Britain's past, present and future. While filming the television series, Frederick photographed each sitter in the studio setting and gifted these remarkable portraits to the National Portrait Gallery in 2017. Each of the thirty eight portraits featured in the display are brought to life through a bespoke augmented reality (AR) app, created by Oath's in-house creative team, RYOT Studio, which enables visitors to view video interview content television series on their mobile screens by holding their phones up to the portraits and touching the artwork to start the video. Oath is committed to promoting ethnic diversity in creative industries and media. Simon Frederick's Black is the New Black collection is a great celebration of the talent and success of the black community in Britain. As such, Oath is honoured to support the display as part of this commitment.